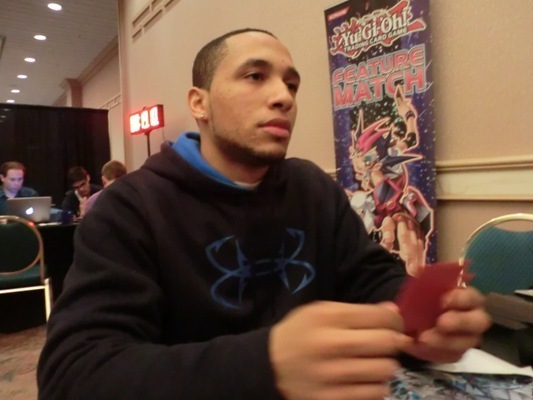 Chrisopher Gonzalez is a local Duelist from Chicago, Illinois, Dueling against Indiana’s Kasey Krick in this Round 8 Feature Match. Both Duelists currently have 6-1 records. Kasey is using an Infernity Deck that packs 2 copies of Instant Fusion, 1 copy of Archfiend Heiress and 1 copy of Archfiend Palabyrinth. He can use Instant Fusion to Special Summon Barox from his Extra Deck. While he has Barox and Infernity Archfiend on his field, he can use the effect of Palabyrinth to banish Barox and Special Summon another Infernity Archfiend from his hand, Deck, or Graveyard. Chrisopher Gonzalez is using a Gadget Deck that packs 3 copies of Chain Summoning. Gonzalez’s ideal play involves Summoning a Gadget and activating its effect as Chain Link 1, activating the effect of Kagetokage in his hand as Chain Link 2, and then activating Chain Summoning as Chain Link 3 to gain 2 additional Normal Summons. Gonzalez can use those additional Summons to Summon Gadgets or Machina Gearframe, overwhelming his opponents with Machines. Both Gonzalez and Krick have had a lot of success with their Decks this weekend, but only one of them can advance with a 7-1 record. It’s time to Duel! 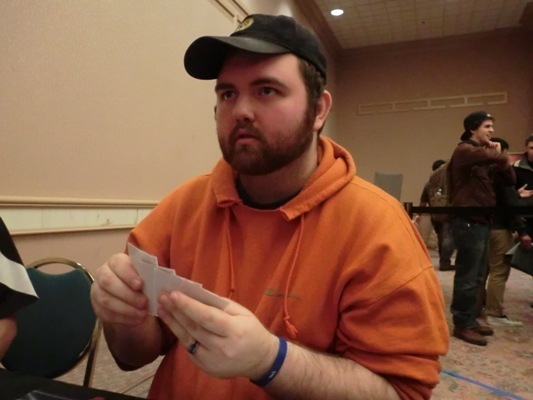 Krick started off Duel 1 by Setting 5 cards to his back row and Setting a monster. Gonzalez opened up Duel 1 with Machina Gearframe, Bottomless Trap Hole, Fiendish Chain, Mystical Space Typhoon, Green Gadget, and Trap Hole. He Summoned Green Gadget and activated its effect. Krick flipped Fiendish Chain to try to negate it, but Gonzalez Chained Mystical Space Typhoon to destroy Fiendish Chain and resolve his Gadget’s effect. 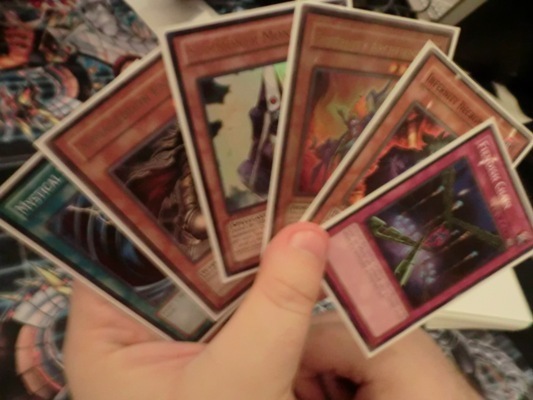 He added Red Gadget from his Deck to his hand and then Set 3 cards before ending his turn. Krick Set a monster and passed his turn. Gonzalez drew Fiendish Chain and then Summoned Red Gadget. He activated its effect to add Yellow Gadget from his Deck to his hand and then combined both of his Gadgets to Summon Gear Gigant X. 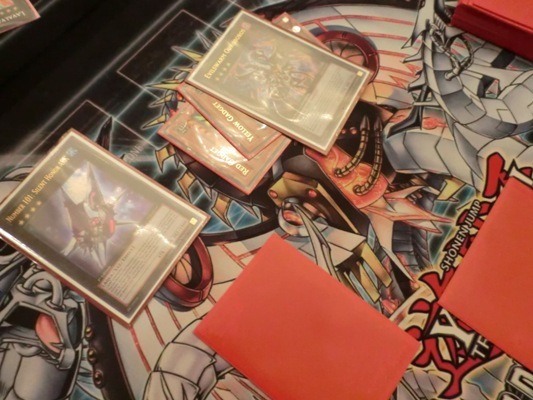 He detached Red Gadget from Gear Gigant X to add Tin Goldfish from his Deck to his hand. He attacked with Gear Gigant X, but Krick flipped Mirror Force to destroy Gonzalez’s monster. Gonzalez Set Fiendish Chain before ending his turn. Krick Set a third monster face-down and then ended his turn. Gonzalez Normal Summoned Tin Goldfish and used its effect to Special Summon Yellow Gadget from his hand. 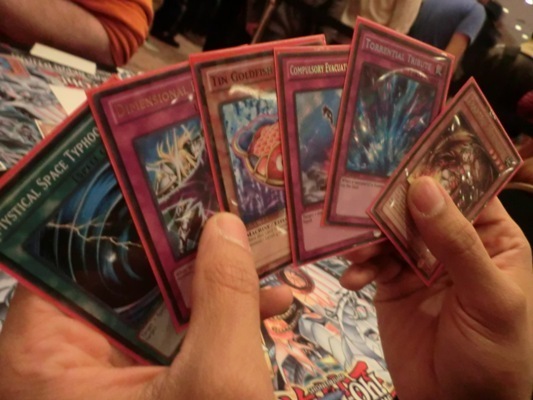 He activated his Gadget’s effect to add Green Gadget from his Deck to his hand and then combined Tin Goldfish with Yellow Gadget to Xyz Summon Lavalval Chain. He detached an Xyz Material from Lavalval Chain to send Redox, Dragon Ruler of Boulders from his Deck to his Graveyard and then banished Yellow Gadget and Red Gadget from his Graveyard to Special Summon Redox from his Graveyard in Defense Position. Krick Flip Summoned Summoner Monk and then activated its effect by discarding Mystical Space Typhoon; but Gonzalez flipped Fiendish Chain to negate the Monk’s effect. Next, Krick Flip Summoned 2 copies of Infernity Necromancer and combined them both to Xyz Summon Leviair the Sea Dragon; but Gonzalez flipped Bottomless Trap Hole and banished it. In Krick’s End Phase, Redox returned to Gonzalez’s hand. Gonzalez detached an Xyz Material from his Lavalval Chain to send Traptrix Myrmeleo from his Deck to his Graveyard. Next, he discarded Redox and Myrmeleo to Special Summon Myrmeleo back from his Graveyard with Redox’s effect. Krick flipped Infernity Break and banished Infernity Necromancer from his Graveyard to destroy Lavalval Chain with Infernity Break’s effect. Next, Gonzalez Summoned Machina Gearframe and used its effect to add Machina Fortress from his Deck to his hand. Direct attacks from Gearframe and Myrmeleo dropped Krick down to 5400 Life Points. In Main Phase 2, Gonzalez combined his monsters to Xyz Summon King of the Feral Imps; but Krick flipped Infernity Break to destroy it. Gonzalez Set a back row before passing. Krick activated Foolish Burial to send Archfiend Heiress to his Graveyard. He used his Heiress’s effect to add Infernity Archfiend from his Deck to his hand. He Summoned the Archfiend and Gonzalez flipped Trap Hole to try to destroy it; but Krick Chained Infernity Barrier to negate the Trap Hole. Infernity Archfiend attacked directly, but Gonzalez flipped Book of Moon to put the Archfiend face-down. Gonzalez drew Forbidden Lance next turn and Summoned Green Gadget. He activated its effect to add Red Gadget to his hand and then banished Traptrix Myrmeleo and Machina Gearframe from his Graveyard to Special Summon Redox. He discarded Red Gadget and Machina Fortress to Special Summon Machina Fortress next. He attacked the face-down Infernity Archfiend with Green Gadget to destroy it, and then direct attacks from Machina Fortress and Redox dropped Krick down to 1300 Life Points. In Main Phase 2, Gonzalez combined Machina Fortress with Redox to Xyz Summon Mecha Phantom Beast Dracossack. He detached an Xyz Material from Dracossack to Special Summon 2 Mecha Phantom Beast Tokens and then ended his turn. Krick drew Armageddon Knight on his next turn and promptly conceded. Christopher Gonzalez takes the first win with his Gadget Deck! Krick started off Duel 2. Krick Summoned Summoner Monk and discarded Mystical Space Typhoon to Special Summon Dark Grepher from his Deck. Next, he discarded Armageddon Knight to send Stygian Street Patrol from his Deck to his Graveyard with Grapher’s effect. He combined Grepher and Summoner Monk to Xyz Summon Lavalval Chain and then he detached Dark Grepher from Lavalval Chain to activate his Chain’s effect and send another Stygian Street Patrol from his Deck to his Graveyard. Krick Set a card to his back row and then banished Stygian Street Patrol to Special Summon Infernity Necromancer from his hand. Next, he banished another Stygian Street Patrol to Special Summon Infernity Archfiend from his hand. With no remaining cards in his hand, he activated his Archfiend’s effect to add Infernity Launcher from his Deck to his hand. Gonzalez opened up Duel 2 with Dimensional Prison, Mystical Space Typhoon, Traptrix Myrmeleo, Tin Goldfish, Compulsory Evacuation Device, and Torrential Tribute. He Summoned Tin Goldfish and tried to activate its effect. Krick tried to negate its effect with Fiendish Chain; but Gonzalez flipped Mystical Space Typhoon to destroy Fiendish Chain and resolve his Goldfish’s effect. He Special Summoned Myrmeleo from his hand and combined it with Tin Goldfish to Xyz Summon Number 101: Silent Honor ARK. He detached both Xyz Materials to attach Infernity Archfiend as an Xyz Material and then attacked Lavalval Chain with Number 101: Silent Honor ARK to destroy it. Gonzalez Set Dimensional Prison, Compulsory Evacuation Device, and Torrential Tribute before ending his turn. Krick drew Reinforcement of the Army next turn and activated it to add Dark Grepher from his Deck to his hand. He Set Grepher and switched Infernity Necromancer into Defense Position before passing. Gonzalez drew Forbidden Lance and Set it. He attacked Grepher with Number 101: Silent Honor ARK to destroy it and then ended his turn. Krick Set a back row and then activated Transmodify by Tributing Infernity Necromancer. He Special Summoned Infernity Archfiend from his Deck and used its effect to add another Infernity Archfiend to his hand. He Normal Summoned the Archfiiend and then combined both Archfiends to Xyz Summon Number 101: Silent Honor ARK; but Gonzalez flipped Compulsory Evacuation Device to immediately send it back to Krick’s Extra Deck! Krick sent his Launcher to his Graveyard next, and Special Summoned Infernity Necromancer and Infernity Archfiend from his Graveyard. He activated Archfiend’s effect, and Gonzalez flipped Torrential Tribute to clear the field! Number 101: Silent Honor ARK protected itself with its Xyz Material and Krick added Infernity Break from his Deck to his hand with Archfiend’s effect. He Set Infernity Break before passing his turn. Gonzalez drew Green Gadget next turn. He Summoned it and used its effect to add Red Gadget to his hand. Then he attacked with Green Gadget and Number 101: Silent Honor ARK. Krick tried to use Infernity Break to destroy Number 101: Silent Honor ARK; but Gonzalez Chained Forbidden Lance to protect Number 101: Silent Honor ARK. Krick Set a monster and passed. Gonzalez Summoned Red Gadget and activated its effect to add Yellow Gadget to his hand. Next, he discarded Redox, Dragon Ruler of Boulders and Yellow Gadget from his hand to Special Summon Yellow Gadget back from the Graveyard, and activated his Yellow Gadget’s effect to add Green Gadget from his Deck to his hand. 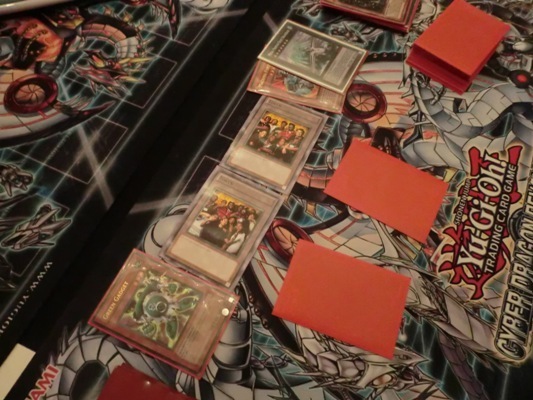 He combined Yellow Gadget, Green Gadget, and Red Gadget to Xyz Summon Evilswarm Ouroboros. He detached an Xyz Material from Ouroboros to return Krick’s monster to his hand and then attacked directly with Number 101: Silent Honor ARK and Ouroboros, dropping Krick down to 100 Life Points. Krick Summoned Archfiend Heiress next turn and activated Transmodify, Tributing Archfiend Heriess. As he looked through his Deck for a monster to Special Summon, he realized there were no Infernity Archfiends left. Upon realizing this, he immediately conceded. Christopher Gonzalez is moving on with a 7-1 record!